Students will learn that the spores in the air produce visible mold colonies when provided with nutrients and moisture. Students will expose petri dishes containing a nutrient agar to the atmosphere (outdoors or even indoors) for a short period of time. The dish is then covered and sealed. Students will check the dish daily for the appearance of mold colonies. It will take approximately four to seven days for colonies to develop. Students will be able to count the number of colonies and probably even see that there are different types of fungi. Fungal spores are present in the atmosphere year round, especially on warm, sunny, and windy days. These spores develop from fungi growing in the environment on many different substrates. They are most common in the soil and on decaying vegetation. Most of these fungi are part of the natural recycling that occurs in nature, although some may be plant pathogens as well. These fungi are easy to grow in culture. 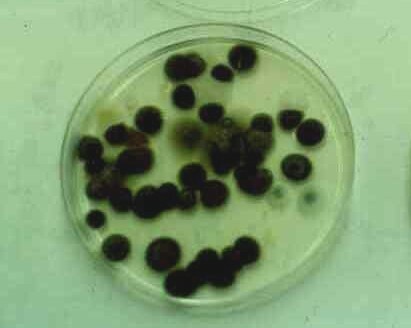 We will be growing the fungi in petri dishes that contain Malt Extract Agar. Agar is a gelatin-like material that is used in the study of bacteria and fungi. Nutrients are added to the agar, and it is steam sterilized and poured into these plates. Like gelatin it solidifies when it cools. Fungi are able to absorb the nutrients and the moisture in the agar as they are growing. Many of these same fungi are introduced indoors through open doors and windows and also on our shoes and clothing when we enter a building. Indoors, many of these fungi find a suitable habitat. Nutrients and moisture are often abundant indoors. We often find these molds growing in bathrooms on shower curtain and walls. We find them growing on foods in our refrigerator. They also grow in carpeting, in basements, and in attics. Spores of many of these common fungi are known to be important allergens. These can act as triggers for rhinitis (hay fever) or asthma. The major purpose of this activity is for students to increase their awareness of what is actually in the air. Although the air may look clear there may be many spores in the air. These spores will give rise to visible mold colonies when provided with a source of nutrients and moisture. Before presenting this exercise, explain how spores are important for the reproduction of fungi (just like seeds are for plants). Also explain how the gelatin-like material in the dishes provides all the food and moisture that a growing fungus would need. Remove the tape from the petri dish. Expose the dish to the air in an open location for about 10 minutes. You can ask children in you class to walk outside during recess and walk around with the dish for 10 minutes. You may want to expose one plate indoors in the classroom for comparison. You may also want to compare a warm windy day with a damp cloud day. You should see different types of molds in the air on a damp day. Be sure to tell the children not to touch the agar surface because germs from their hands contaminate the agar surface. After you have exposed the plate for ten minutes, cover the dish and tape it shut with scotch tape. You should see colonies starting to develop in four to seven days.